The California vacation is drawing to a close, so things around here can start to get back to normal! With any luck, the numerous FedEx boxes sent from Comic Con back to Preserve headquarters will make it intact, and a great many hard-won exclusives will join the archives. 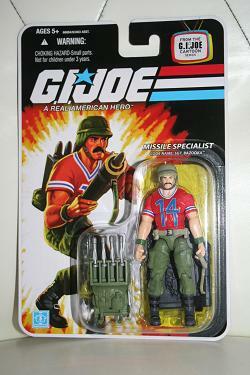 Today let's start taking a look at the 2nd wave of the new GI Joe Modern Era figures, with Bazooka! This is really a fantastic looking figure, and while the price point for this wave has jumped up to $7.99 a figure, at least you get some great and very substantial accessories. You also have to love the bright colors on the accurate outfit, definitely a great tribute figure to a very popular character!